We’ve taken the time to find the best, most affordable security components for our systems. This DVR comes with a variety of features, all of which are very user friendly for configuring. With this unit you can fully customize recording schedules, resolutions of recording for each camera, and it features fully customizable motion detection areas as well. Using the on-screen display menu, you can easily set which areas of the screen you want motion detection, and which areas you do not. This is especially useful for environmental movement that may cause unwanted triggering of motion detection. Viewing your recorded video is as easy as 123, it has a very user friendly interface, while not compromising advanced features. 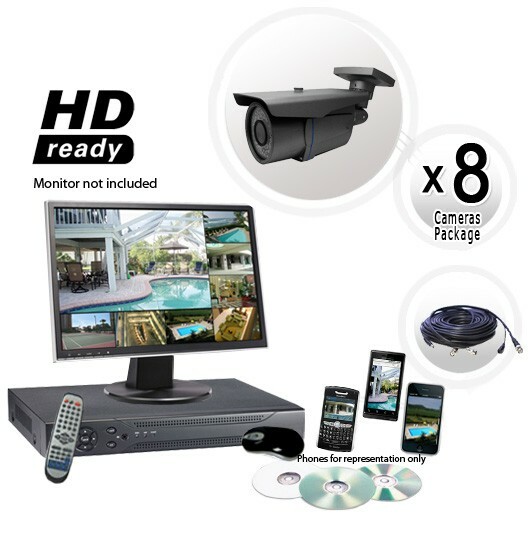 This DVR also features remote viewing, not only from a web-browser anywhere with an internet connection, but from select Smartphones* as well. Imagine being able to pull up your cameras with the ease of opening an app on your phone. Email notification can be set as well, so you will know about an event wherever you are. Picture this: You are on the go, and you receive an email notification to your Smartphone detecting motion in your garage. Immediately you pull up that camera on your Smartphone! It’s a false alarm, just a pesky rodent this time, but what about next time? Now, for the cameras: these cameras are top of the line IR cameras with an unheard of 700TVL. They come with an amazing 2.8-12mm adjustable zoom lens that gives a 90 to 30 degree angle of view, with easy external manual zooming. At night time, this security camera can see an incredible 200 feet thanks to it's 72 IR LEDs. Comes standard with a 3 axis bracket, which is designed to conceal cables. Higher horizontal resolution over 650 TVL. Confirmed maximum resolution to achieve true 700 TV Lines of Resolution. Digital Noise reduction (DNR) is a function that reduces the image noise to improve the image quality of the camera. In particular, it reduces the noise which is generated under low light conditions and other high-gain states. The Effio-E comes with a space-based Noise Reduction function. 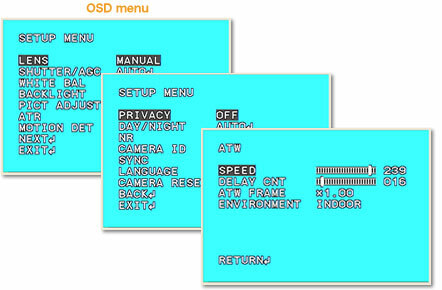 Preset OSD Menu: The "Effio-E" signal processor includes OSD (on-screen display) functions that allow camera settings to be made using the joystick or button controller located on the camera cable or inside the camera. ATR/ATR-EX: The ATR (Adaptive Tone Reproduction) function provides gradation compensation to improve the contrast of subjects whose gradation has been lost in cases where, for instance, both low-luminance areas and high-luminance areas exist in the same picture. The ATR function improves the visibility of the entire picture by providing optimum gradation compensation for the image in one field based on the luminance information.